Based on information from the National Institute for Occupational Safety and Health, 60 workers die in trench cave-ins each year. Accidents resulting from trench collapses cause significant financial costs due to property damage, work stoppage, workers’ compensation claims, and even lawsuits. Trench failures and cave-ins occur quickly and without warning. Workers can become immediately trapped from the pressure of the soil which often results in death...one cubic yard of soil can weigh approximately 3,000 pounds, the equivalent of a mid-size car. The following steps can help keep your utility personnel safe while trenching and excavating. Sloping or Benching – cutting back the trench wall at an angle or a step pattern inclined away from the excavation trench. Shoring – typically a system of timbers to support trench walls to prevent soil movement and cave-ins. Trench Boxes – steel or aluminum hydraulic box with bracing to apply pressure on the earth walls of the excavation. Install ladders, steps, ramps, or other means of safe access within 25 feet of workers at all times. OSHA requires safe ingress and egress to all excavations 4 feet or deeper. Utilize an atmospheric testing device to test for low oxygen (less than 19.5%), hazardous fumes, and toxic gases that may be present in the trench. Position heavy equipment and tools away from trench edges. 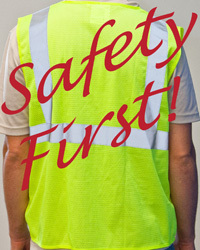 Wear your personal protective equipment (PPE) – hard hat, safety glasses, reflective safety vest, steel toe boots, and/or hearing protection. Following these five important steps can help you, your employees, and/or your contractor to efficiently complete your project, while also avoiding potential trench accidents and a visit from your local Occupational Safety and Health Administration representative.